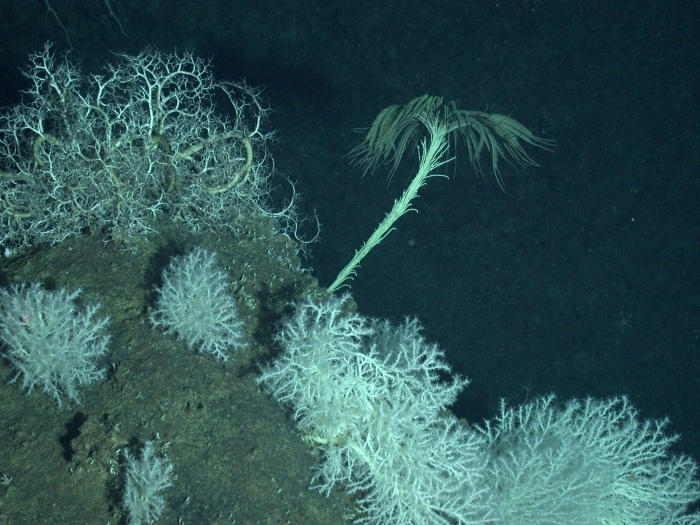 Basket stars, stylaster corals, and a crinoid found on a deep ocean dive. As much as people depend on the oceans for survival, we’ve only explored 5 % of the ocean floor and only half a percent of the ocean itself. We know more about the face of Mars than we do about our own oceans. The crazy thing is, the oceans make up more than 70% of the Earth’s surface, and if you include all the water in it (not just the surface) it accounts for more than 99% of all the livable space on earth. More than 2.5 billion people worldwide depend on fish as a primary source of protein, but all of us depend on the ocean for survival. Part of the reason we know so little about it is that it’s hard to get to. Spending time underwater isn’t easy, but exploring the deep ocean is harder than going to the moon in some ways.